The exhibition “Partners in Design: Alfred H. Barr Jr. and Philip Johnson,” currently on view at NYU’s Grey Art Gallery, traces the friendship between Barr, the founding director of the Museum of Modern Art (MoMA), and Johnson, the first director of MoMA’s Architecture Department. Curated by David A. Hanks, the show originated at the Stewart Collection at the Museum of Fine Arts, Montreal, and traveled to the Grey Art Gallery and other venues. The exhibition explores some deeply personal and little-known aspects of MoMA’s early years, including the first introduction to the U.S. of modernist concepts forged at the Bauhaus School in Weimar, Germany. In this blogpost, I will consider what contemporary reviewers found most appealing and meaningful about the exhibition, and respond to their comments from my own experience as an undergraduate intern at the Grey Art Gallery. Farago’s lighthearted remark, however, is tinged with various concerns, and in the end, he turn toward biting irony. For Farago, it is for “better or worse,” and certainly unusual, that the objects on display in the Grey’s exhibition, which would normally look quite outdated after almost a century had passed, still appear “as à la mode as they were in Herbert Hoover’s day [early 1930s].” For Farrago, today’s unfading fetishism for modernism has the unfortunate result of discouraging innovation. He sees the legacy of Barr and Johnson as not merely bringing Bauhaus aesthetics to the US, and he admires their courage to discover the “new beautiful” in the midst of the mundane, and to recognize it as the art of our time. Yet, visitors to the exhibition don’t seem to grasp this underlying lesson. When I led gallery tours with other student docents, most visitors told us how much they enjoyed learning the history of the introduction of Bauhaus to the U.S. and the anecdotes of Barr and Johnson, how they found the exhibition objects resembled the chairs in their kitchens, and how they would love to have Barcelona chairs for their new apartments. I appreciated their comments, but at the same time, I saw that in their lives, they were looking backward instead of forward. Farago asks his readers “if there is anything you could put in your house today that would express the same forward drive that Barr and Johnson embraced?” He encourages every visitor to take away not only historical knowledge, but also the avant-garde spirit and “forward drive” of Barr and Johnson. In other words, he feels that the way forward is hidden in our mundane lives, just waiting to be recognized. Farago’s outlook toward new experiments in design does not prevent him from recognizing the exhibition’s historical significance, especially in today’s paradoxical world. On the one hand, new furniture strongly resembles that from a century ago, while on the other hand, the original artifacts from the past are being replaced by new versions. When Farago’s review was condensed into a single paragraph in the New York Times’s listing section “Art and Museums in NYC This Week,” it included his wry mention of the New York Four Seasons restaurant’s new owner’s decision to dismantle the “one of a kind” interior space designed by Philip Johnson and Mies van der Rohe and put it up for auction. He comments, “if you’re into Modernist revivals, you’ll do better here [at the exhibition “Partners in Design”] than at the ghastly new restaurant in Johnson’s old Four Seasons.” Farago’s lamentation was shared by a visitor in one of my gallery talk groups, who told me that the Four Seasons overhaul was really unfortunate. With Johnson’s Four Seasons disappearing, the Grey exhibition provides a timely harbor for Modernist nostalgia by tracing its first introduction to the U.S. In such a moment, I see the social impact of the exhibition: curator Hanks and gallery staffs’ efforts to reconstruct the homes of Alfred Barr and his wife, Marga, and Philip Johnson, in sharp contrast to the Four Season’s destruction. 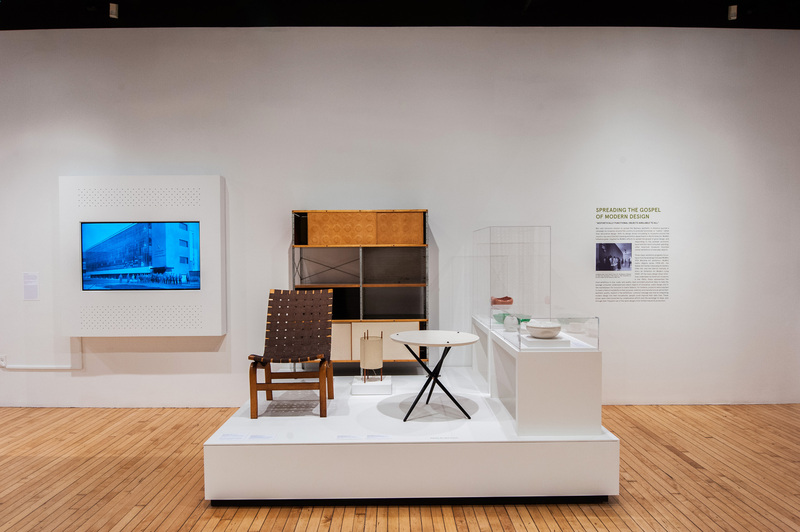 From a different perspective, Allison Meier’s review “The Men Behind MoMA’s Taste for Modernist Design” on Hyperallergic highlights the exhibition’s historical context. In the opening of her article, Meier acknowledges MoMA’s financial struggles at the time of its first opening: “MoMA opened a week after the catastrophic stock market crash of October 24, 1929. That the museum would succeed, or even last a decade, was not a given.” Beginning with this emphasis on the financial crisis, Meier cast Barr and Johnson’s determination and achievements in spreading Modernist aesthetics in a more powerful light. While I was reading the exhibition catalogue, it seemed to me that the fact of the Great Depression helped explain the popularity of “industrial, abstract beauty,” and that the Bauhaus School’s affordable and mass-produced furniture and other objects would doubtless make them extremely appealing to an American audience during this time of financial crisis. Yet, interestingly, a senior scholar studying the Bauhaus School in the U.S. who attended one of my gallery talks told me that the American Bauhaus was, in contrast with the European Bauhaus, rather luxurious. Keeping her comments in the back of my mind, I found answers in Meier’s review and in the exhibition itself. After acknowledging the financial straits of the 1930s, Meier points to the differences between apartment designs for the Barrs and Johnson: even though they both shared interests in the machine-made aesthetic, “Barr had relatively modest tastes, favoring American industrial design, while wealthier Johnson hired renowned architect Ludwig Mies van der Rohe to create his space.” Barr’s and Johnson’s different choices were largely due to their different incomes. Barr, as the director of the new MoMA during the Depression, depended on his limited salary, while Johnson, who came from family money, served at MoMA without salary and hired a secretary on his own account. Their differences are borne out in the contrast between Barrs’ and Johnson’s apartments, displayed side by side in the center of the exhibition space. Practicality, a principle so central to the Bauhaus School, plays a huge role in the home design of Barr, who bought comparatively affordable, American-made, locally-produced Bauhaus–style furniture designed by Donald Deskey. Johnson, on the other hand, commissioned Mies van der Rohe and his partner Lily Reich to design his apartment, using their costly, custom-designed furniture imported from Germany. The reviews of Farago and Meier both provided me with new insights into “Partners in Design.” When asked what I have learned from the show, I will tell you that I not only discovered the rich history of the first introduction of Bauhaus style to the U.S., along with Barr and Johnson’s friendship and their great contribution to spreading modernism, but that I also gained greater appreciation for the importance of preserving the past. Above all else, the exhibition inspired me to discover new beauty in the mundane everyday life of our time. Allison Meier, “The Men Behind MoMA’s Taste for Modernist Design.” Hyperallergic. January 5, 2016. Accessed November 7, 2017. https://hyperallergic.com/255892/the-men-behind-momas-taste-for-modernist-design/. Mengyue Wu is an undergraduate intern at the Grey Art Gallery. She is studying Art History at New York University, and will graduate in December 2017.